Southern 100 Racing is saddened to learn of the passing of former Club President, Bob Dowty on Tuesday 28th July 2015, aged 84. Bob competed in the Southern 100 in 1957 finishing 8th in the 500cc race and continued racing on the Billown course up to and including 1959. Having ‘hung-up’ his leathers at the end of 1959, he commenced the new decade as a Travelling Marshal on the ‘Southside’ Course for the 1960 races, adding another two wheels in 1961 taking over as the Official Car Driver, a position he held for eight years. He then became Deputy Clerk of Course in 1969 through to 1979. Bob joined the Club Committee in 1960, taking the position of Chairman in 1961 and 1962, becoming Chairman of the Race Committee between 1964 and 1982, taking ‘early retirement’ at the Annual General Meeting in 1983. Bob Dowty was elected Club President in 1989 and continued to hold the title until he finally handed in his Chain of Office in 2002 when he was elected one of the first two Life Members - the other being another long serving member Artie Bridson. An astute and successful businessman away from the Southern 100, Bob Dowty devoted thirty-six years as an official and after he stepped down as President, he still continued to take an interest in the activities of the ‘the friendly races’ and attended the races each year, although he missed the Diamond Jubilee Races this year due to ill health. 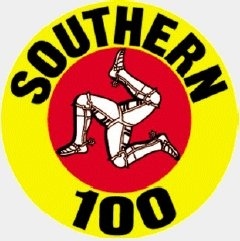 The Committee, members and all associated with the Southern 100 send their sincere condolences to his wife, Ann and his family and friends at this sad time. From being one of the early competitors to a senior official and the club’s first President, Bob helped make the Southern 100 the popular and successfful event it is today - for which we are greatly indebted to him.